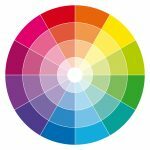 Carole is developing a class on color! 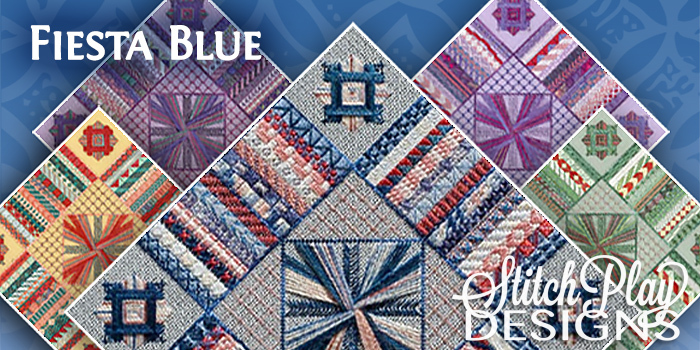 Stayed tuned here for more information or email Carole at carole@stitchplay.com. 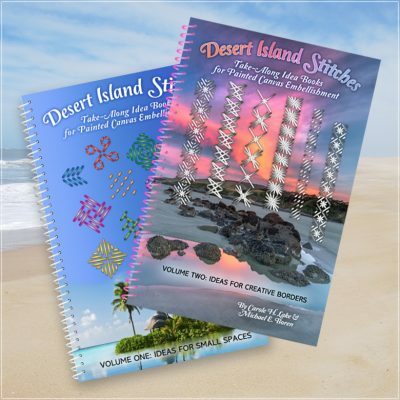 Our two-part series of take-along books for painted canvas embellishment are not your usual stitch books! 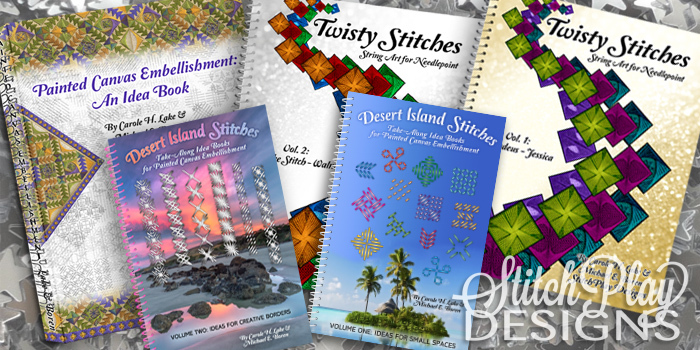 Carole and Michael have compiled these idea books of stitches and borders for the smallest of spaces! 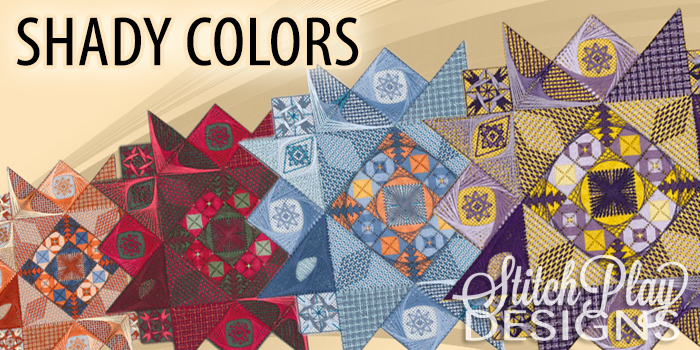 These toss-in-your-tote size books make enhancing any needlepoint design fun and easy! Double Fan Doubled? Jessica? Walneto? Do these stitches give you heartburn? You CAN do them! 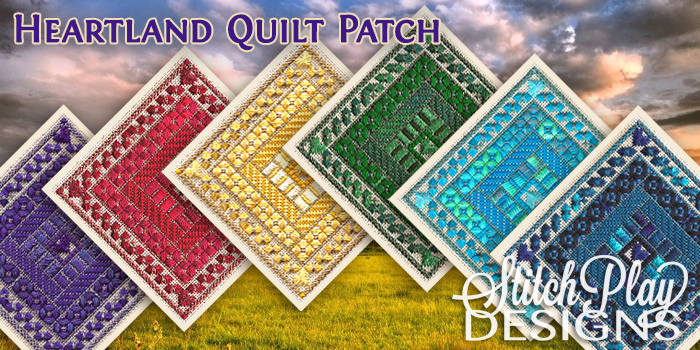 Twisty Stitches offers you step-by-step, stitch-by-stitch (big enough to see!) 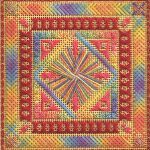 photos of how to do these scary needlepoint stitches. Learn not only how to do the Amadeus, Double Fan and Double Fan Doubled, Eight Point Star Jessica, Crescent, Mistake Stitch, Plaited Rays, Sprats Head, Sheaf Stitch, Waffle and Walneto and Chilly Hollow stitches, but move on to dozens of carefully charted (and pictured!) variations of each! 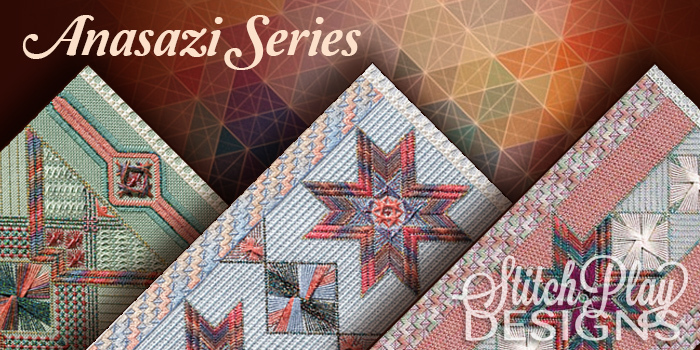 These are gorgeous stitches in two fabulous all-color spiral-bound books. 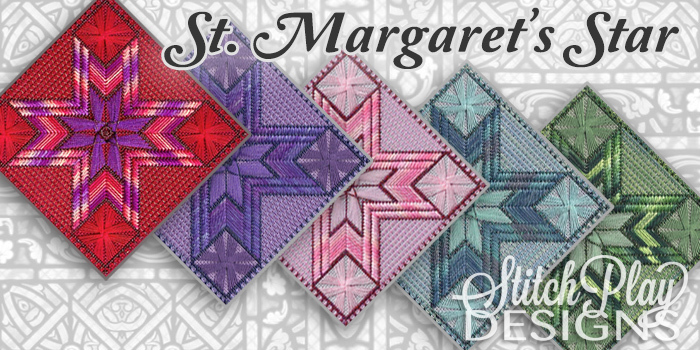 One of Carole's first few, this pattern has updated with new and currently available threads! 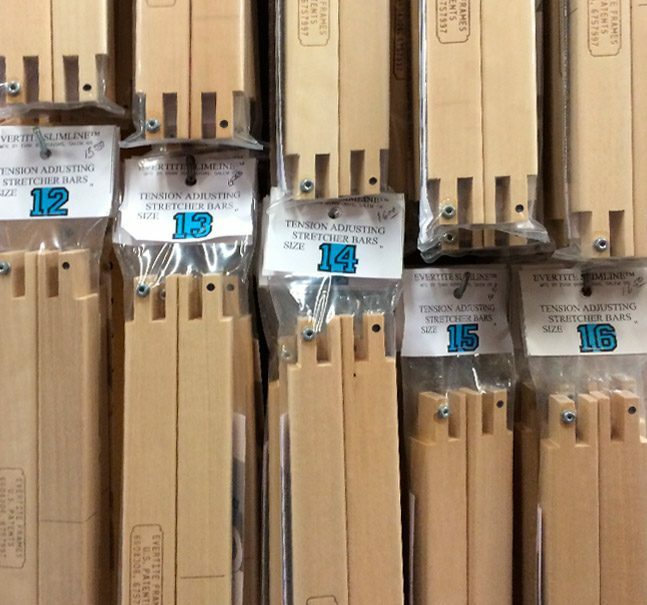 Don't forget to pick up a variety of sizes of ever useful Evertite® Bars! 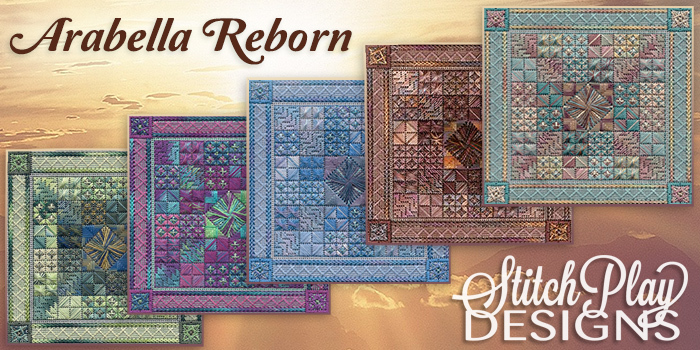 Pretty as a summer sunset, Bali Ha’i is a perfect stitch for a warm evening! 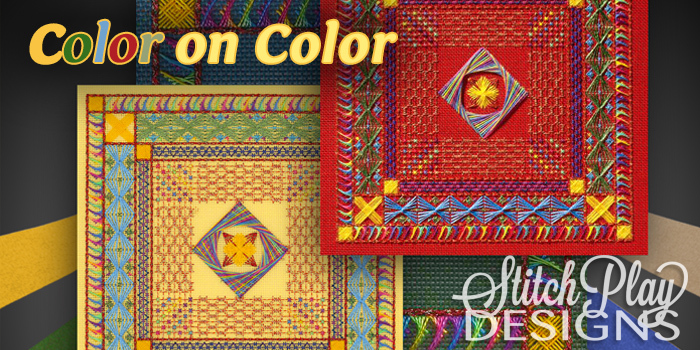 Stitched on a piece of 8" x 8" buttercream 18 mono canvas with Caron Collection and Kreinik threads, the pattern comes with five additional colorways and is FREE for download on our Free Patterns page. Carole is a true treasure! Her imagination and creativity are limitless and evident in both her designs and books. 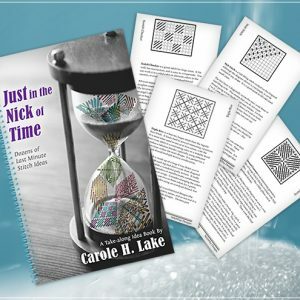 Her directions are fabulous and she has the ability to make even the most complicated designs friendly for both beginners to those highly advanced. Above all, she is compassionate and always available to answer *any* question a stitcher might have. The canvas work community would be sorely lacking without her contributions and insight. Carole Lake and I have been friends for almost 28 years. She is a very intelligent and talented woman with a sharp wit. She is someone you can count on when the chips are down. 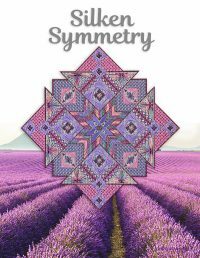 She and I both have been teaching for quite a while and we can turn to one another for an honest appraisal of one another’s work and an objective eye. You don ’t find that often. Carole gave me the encouragement and confidence to stitch my first Double Fan Doubled. Her passion for encouraging you to step out of your comfort zone and try new stitches has been gone a huge way in helping me be a better stitcher. 1. Her directions are the best in the business….you totally get what you pay for. Her projects are very easy to understand because she makes them that way. 2. Carole is not a “fussy” stitcher, pure enjoyment. 3. Her personality is great, I love her. I have taken many classes from Carole in person. She always made the classes a lot of fun and I learned so much. She doesn’t get upset if you change colors or threads. She encouraged me to stretch my thoughts on painted canvases that weren’t just basketweave.